Normally I don’t share what we are studying at Bible Study until long after the ink has dried on the pages of my members guide and I have never taken more than one study at a time. Honestly, if you are like us we are a busy family and I wasn’t really sure we were going to do both of them. I had already given myself permission to skip out of the homework if I felt like it was a little too much (horrible I know) and for those who have been in study with me before you know that I always finish my homework. But then last night the coolest thing happened to me at Bible study that made the hairs on the back of my neck stand up and for the first time that I can recall I know for sure that I am supposed to be taking them both. Now this isn’t a review of either study because we have only just begun but, I felt lead to share with you what we are studying (in case you have nothing to study) and have included the course descriptions of both studies. Actually I wasn’t really sure if I wanted to do any Bible study classes at all this fall if I am going to be totally honest with you but I so glad I signed up! The book of Hebrews is a rich, dense section of scripture that can intimidate the most scholarly biblical student. But Lisa Harper makes digging into Hebrews fun and doable, as only she can, without losing an ounce of depth. Hebrews was a sermon for a specific people and culture in the midst of martyrdom and persecution, but is also so relevant for us today, reminding us to continue walking toward jesus regardless of our culture or our circumstances. Join Lisa as she journeys through this bridge between the Old and New Testaments to get to the heart of the matter: Jesus is our accessible King. He is not a faraway God, but an up-close Redeemer who draws near to us. Hebrews helps women make the connection between God the Father and God the Son and reminds us that Jesus is supreme, but he he is also compassionate, empathetic, and loving to no end. We just finished watching the second video of Hebrews last night when we were reminded that not only do we have to pay attention which in our present day and age can be really hard to do but we were also reminded that as Christians we are wired for war. Wired for war… let that one sink in for a moment. If we are wired for war then I better know what steps I need to take to make me not only effective but also protected. Can you see WHY the hairs on the back of my neck were raised?!? Seriously the coolest experience ever. I was reminded that everyday there is a war, an invisible battle, that takes place in the heavenly places. Even if I can’t see it. I am very excited about both of these studies and can’t wait to see the transformation in myself and in those around me. What a great study! I think it provides such invaluable insight. These sound like good bible studies. I have been debating on starting one at home. It’s hard to find the time. I’ve been looking to something to read in my down time and I’ve heard great things about this.Thanks for sharing with us. I’m a Christian. I’m glad to know that you are also a Christian. I am looking for new Bible study. I find it is great for me. Thanks! Such a good book. I guess everybody can learn so many things from this. Thanks a lot for sharing with us. I really appreciate it. These books sounds interesting and I’ll try to get them to read. I have had nothing to do these days and reading these books maybe a good choice. Thanks for sharing these to us. Hope you enjoy with your Bible Study! I have heard so many good things about the Armor of God! i put it on my list to do yesterday. Right now, I’m doing the Breathe study by her. Also, fabulous! My Bible study group almost did the Armor of God study. It looks amazing! We ended up doing Fight Back with Joy, which I highly recommend. 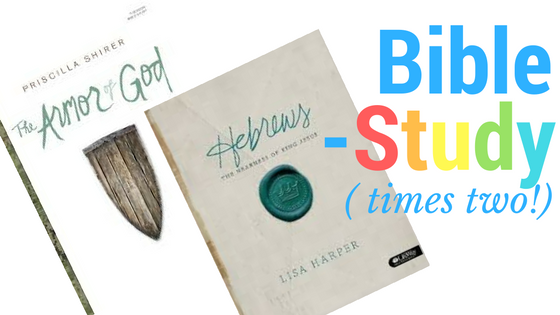 Hebrews is a really rich book of faith and history! What a fun study you are going to have. I have been looking for a new Bible study. These sound perfect for me! Hebrews is a great book. Theres so much to learn about the culture it’s crazy! I love it when God works things out like this! Hope you enjoy both of your Bible studies. LOVE this. ANY helps to understand God’s Word is awesome. Armour of God – oh my goodness. Priscilla Shirer is my girl. She has a gift of helping me understand God’s truth so well. Well done.